To quantify the popularity of passive investing, we can simply look to product creation. What is the most popular financial product of the day? Clearly, it’s index ETFs targeted at passive investors. To feed this insatiable appetite for stocks, promoters happily pushed forward mergers creating new shares and still more investment trusts. Early in August the New York Times noted that “hardly a week now passes but a new investment trust appears.” By September the birth rate had swollen to nearly one a day, a pace that “left Wall Street in a quandary as to where the movement will halt.” By year’s end 265 new investment trusts had produced a staggering $3 billion in new shares; 14 of them had assets exceeding $100 million. Probably the greatest expression of the popularity of passive investing is the fact that there are now more indexes than there are individual stocks in the market! If there’s one thing you can count on it’s that Wall Street will never fail to cater to the needs of speculators during a mania. If there’s two things you can count on it’s that you don’t want to take part in the Wall Street product du jour. 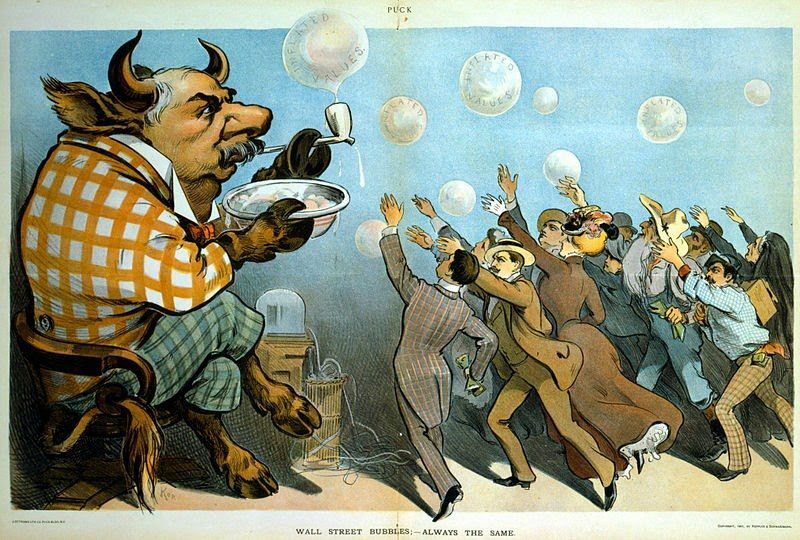 In addition to 1929, ETF creation in today’s marketplace is reminiscent of the dotcom bubble. Back then, while ETFs were just getting started, we saw the offering of a ton of ridiculous IPOs and the creation of a number of online discount brokers catering to the growing hoard of new daytraders. Both of these prior product bubbles famously ended badly. I don’t expect the current product bubble in ETFs to be quite as bad. Still, passive investors may also want to consider just what its popularity means. In bear markets, investors prefer absolute return strategies. In bull markets, they prefer relative return strategies. This is really just another way to express risk appetite. To prefer relative return investing is to express risk seeking. In this case, investors are saying they don’t mind drawdowns. Their goal is to capture as much upside as possible. Conversely, to prefer absolute return investing is to express risk aversion. Here investors are saying they really want to limit drawdowns and are willing to give up some upside in order to do so. Passive investing is the ultimate form of relative-return investing as it’s goal is to capture as much of the the return of the index as possible, both ups and downs, at the lowest possible cost. Thus the massive popularity of passive is a clear expression of widespread risk seeking behavior without any regard for traditional investment merits. And isn’t this just the definition of a mania? Like those before it, the current mania guarantees a painful outcome for those taking part. Some of the most valuable valuation metrics suggest it could be on par with those prior episodes mentioned above. I understand that even Warren Buffett has endorsed passive investing. However, he has also famously said investors should ‘be fearful when others are greedy.’ Considering the current greed expressed via passive investing is on par with that of other prior manias, which of his dichotomous pieces of advice should investors heed? I’ll go with the one that he attributes all of his personal success to (hint: it wasn’t passive investing).